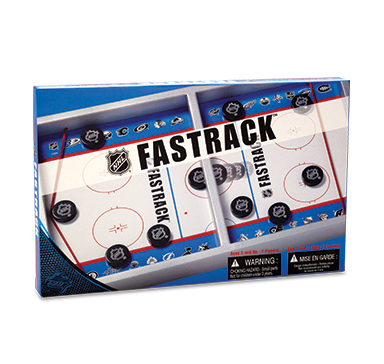 NHL® Fastrack brings your favorite sport to your fingertips! Officially licensed by the National Hockey League®, this puck passing game produces kinetic energy and exhilarating competition. The first to send all 10 pucks to an opponent’s side takes home the winning Cup! 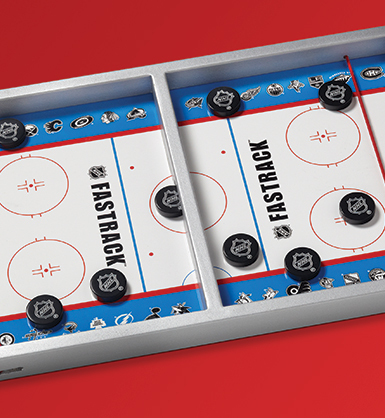 Just like a hockey game, NHL® Fastrack calls for lightning-speed, accuracy and just the right amount of chance to win. The NHL® branded wooden tray is detailed to replicate a real hockey rink, and the sidelines feature logos of teams adored by hockey fans all over North America.